Trichiasis - Causes, Signs and symptoms, Complications and treatment of Trichiasis. The term trichiasis means abnormal direction of the eye lashes. The abnormal lashes rub against the corneal surface of the eye ball with resultant irritation, watering and potential damage to the cornea. All causes of entropion (entropion = lid margins turn inward) produce trichiasis, for example spasm of muscle of riolan, fibrosis of palpebral conjunctiva, lose of tone and elasticity of lid margins, Steven Johnson's syndrome. 1. Congenital Trichiasis: It is also called Distichiasis. In this disorder an extra row of cilia is present behind the grey line in the place of ducts of the meibomian glands. Meibomian glands are absent. a) Trachoma, due to fibrosis distorting the follicles. 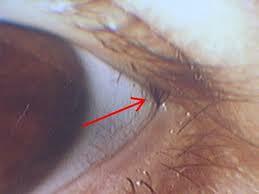 b) Ulcerative blepharitis: due to fibrosis near the follicles. Pure trichiasis is treated by operation. 1. If the upper lid is involved then it is corrected by "Van-Millengen's operation" which consist of displacing the rubbing lashes by placing a mucus graft in the grey line. 2. If lower lid is involved then it is corrected by "Webster's operation" in which a mucus graft is placed in an incision which is made in sulcus subtrasalis. 3. If rubbing lashes are more than four then they are treated by.